As with previous Austin Bakes fundraisers, there is an option to make a monetary donation using a credit or debit card through our Austin Bakes For Nepal FirstGiving page. 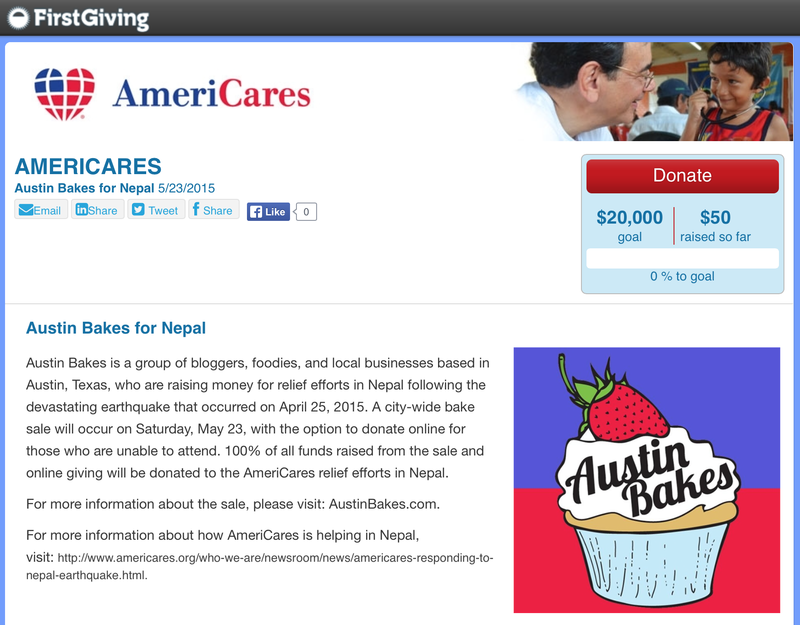 Online donations will go directly into the fund set aside for Nepal through AmeriCares. Those who are unable to visit one of the bake sale locations can still participate and help us reach our goal of raising $20,000 for relief efforts in Nepal through this option. For anyone whose employer has a matching gift program, this is an excellent way to maximize donations. FirstGiving makes that as easy as clicking a button. Curious about where the money is going? Check out this post; it has all the answers. This entry was posted in Austin Bakes for Nepal, Blog, News about the sale, Past Sales and tagged AmeriCares, Austin Bakes, Austin Bakes for Nepal, AustinBakes, Bake Sale, Fundraiser, How to Help Nepal, Humanitarian aid, Nepal by lrawlinson2. Bookmark the permalink.